Color of the Month January 2018, finally! We’re off to a great but rough start. We started the New Year in vintage style and then spent a couple days in Indianapolis. Follow me on instagram for daily details! Then we came home part of a day early to avoid the snowstorm near my parents and fell sick with a horrible virus/cold. Whatever it is it’s hanging on. In the beginning it yielded a super high fever with a couple days of sleeping for me, even my eyes were so sore I couldn’t have them open long enough to read a magazine or get some good sick tv time in. Yuck. I’m on the mend now and slowly getting some energy back, and Stephan who had a milder version is feeling much better too. So, delay in getting the massive amounts of holiday decor away, delay in color of the month! I often like to start with a crisp blue January. It feels fresh and clean after all the decor comes down. fave vintage:awesome Russel Wright melmac my parents picked up for me! 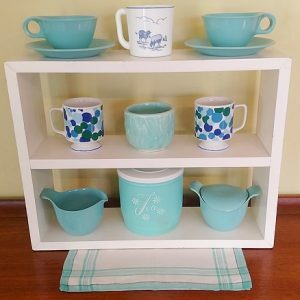 Vitrock little bo peep mug, McCoy butterfly planter, pedestal mugs, more melmac:cream and sugar, cute tea canister, anchored by a plaid napkin. 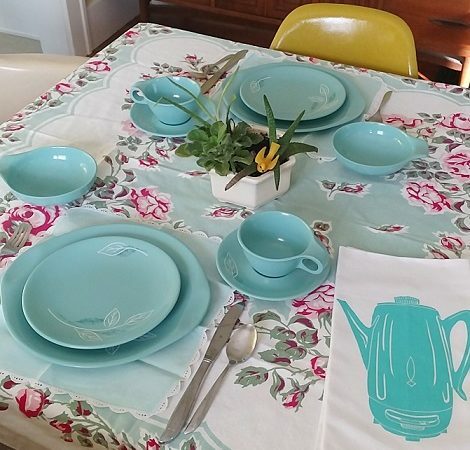 Fave vintage: a gorgeous vintage tablecloth grounds all this fantastic Russel Wright melmac! A cute lil planter, and a couple sweet napkins as placemats make the grade along with an artgoodies organic tea towel with percolator print.